Cement slurry is a very abrasive product, this can cause many problems to pump. 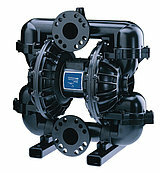 The material choice for the wetted parts of the Verderair diaphragm pumps is huge. Ball valves, seats, diaphragms, all wetted parts are available in a large choice of materials preventing abrasion for each application. This makes the Verderair diaphragm pumps excellent pumps for pumping cement slurry. Verderair has also excellent priming capabilities to pump up the abrasive cement. Cement consists of the raw materials sand, shale, iron, ore, clay and industrial by-products. The main ingredient however, is limestone. Cement is the binding substance to keep together the raw materials (sand, gravel, crushed rocks, water and chemical additives) for concrete production. Pumping cement can cause many problems.